Eric Vorstenbosch is a professional military aerial photographer based in the Netherlands and an ISAP member since 2005. After completing his education at the Graphic School in 1991 he started out as a photographer in the Royal Netherlands Air force. 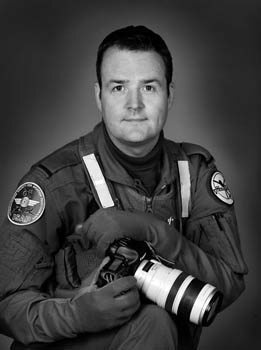 In 1997 an opportunity was offered him to get into the training to become, one of two, fulltime military aerial photographers of the Royal Netherlands Air force. The aerial work Eric is doing from then on has different disciplines. Going from aerial photography with a build-in vertical camera system to the “bird eye view” aerial photography and video. Doing air-to-ground assignments for reconnaissance and supporting exercises and training for units of the Ministry of Defense. The second assignment is air-to-air photography and video where briefings and directing large formations up to 13 aircrafts demands a great organization talent. “After all the preparations, directing aircrafts to their positions and making sure everybody knows what we are going to do up there. Making the picture at the end is like icing on the cake”. Eric reached his 1000 hours of flight on September 13th, 2011. These hours were logged flying in more than 750 photo flight sorties over various countries.